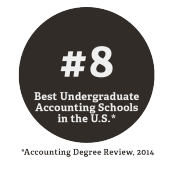 The Accountancy (ACC) major in the Wake Forest University School of Business provides a foundation in the concepts, principles and practices of accountancy and business that students need for success in the early years of their careers. The major also provides the foundation for students to successfully complete the Master of Science in Accountancy (MSA) degree. 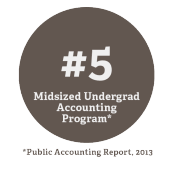 Students majoring in accountancy apply to the five-year accountancy program (which includes both the baccalaureate and master’s program). This integrated five-year accountancy program offers the flexibility and rigorous preparation required to pursue a variety of accounting-related careers, including auditing and assurance, taxation, business advisory services, forensic accounting, and investment and commercial banking. Through courses, seminars, case-based research in finance, accounting, auditing and taxation, MSA students acquire the skills necessary for professional success. An internship in the fourth year provides the critical link between classroom knowledge and professional experience. The Wake Accounting Society is a member-based student organization run by student leaders for undergraduate students interested in learning about the accounting profession from practitioners, faculty, and other students. The policies and programs of the Wake Accounting Society are administered under the guidance and direction of a faculty adviser from the accounting program. Today’s accounting and finance professionals must possess knowledge, experience, and a well-developed set of technical skills to meet the challenges of a wide range of business environments. These challenges are addressed by the Master of Science in Accountancy (MSA) program at Wake Forest School of Business. The MSA program prepares students for a variety of careers in accounting and financial management. Professional competence, however, extends beyond academic preparation. 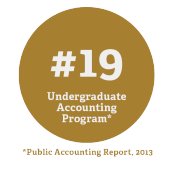 Accordingly, the MSA program at Wake Forest University includes a ten-week, paid professional accounting or finance internship during the academic year. The internship provides a critical union of knowledge and experience. The MSA also prepares students to take the CPA examination at the completion of the program. 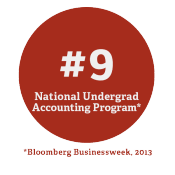 The Wake Forest School of Business MSA has received national recognition for our students’ success on the examination, ranking #1 in CPA pass rate 13 times since the program began in 1997, and ranking in the top 5 of all schools nationally in 17 out of 18 years. All students participate in intensive course work to prepare for a career in auditing, tax consulting, investment banking, or financial consulting. Most MSA students receive significant financial aid for the fifth year of study, offered to students on a competitive basis.